It has been an unusual and dramatic natural event the past few days, but now an uneasy reality is setting in. Scientists and government officials in Northern Europe and beyond are beginning to worry: How long will the Iceland volcano continue erupting? Ice chunks the size of houses tumbled down from a volcano beneath Iceland’s Eyjafjallajokull on Thursday, as hot gases melted the ice. 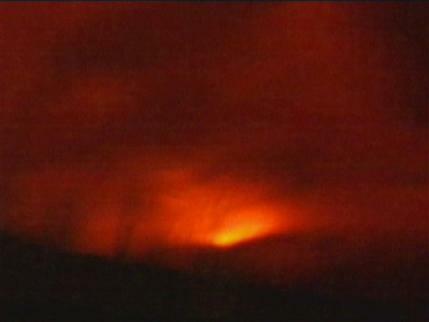 The volcano began erupting on Wednesday for the second time in less than a month. Torrents of water filled with ash and pumice roared down the steep slopes of the volcano. Reuters has an amazing photo reel of the volcano. The U.K. Daily Mail reports a million Britons are stranded in various parts of the world unable to get home due to flight restrictions. Fresh produce and other imported foods are growing scarce at U.K. groceries. Iceland’s volcano eruption is now costing airlines around the world an estimated $200 million in revenue per day. Plane engines can be totally disabled by flying in the silica-laden particulate clouds. The ash is beginning to settle in the U.K. The cloud of ash and smoke is now at least 4 miles high and can be seen from outer space and could impact the weather worldwide. In addition the World Health Organization (WHO) has now issued a warning for people in northern Europe to consider wearing facemasks to avoid breathing the grainy smoke. Silicosis is an incurable, irreversible lung disease that progresses even after exposure has ended. Based on the health histories of other volcanic explosions, such as Mt. St. Helens in the United States, the WHO says the health risk could continue long after the eruptions have stopped. Icelandic volcanoes have been erupting from deep below ancient glaciers since before the dawn of man. Some of the gaseous clouds and lava flows were so huge they affected Earth’s climate. It is believed the “Little Ice Age” (roughly 1700-1900) was especially harsh because of the 8-month-long Laki volcano eruption in Iceland in 1783. “When the Laki volcano erupted in 1783, it caused a cloud of poison gas to drift to Britain, where hundreds died. The smog and ash caused famines in Western Europe. Crop production plunged. The winter of 1784 was one of the coldest in history, with the Mississippi River freezing as far south as New Orleans. The last time there was a major eruption in Iceland, flooding followed within minutes of the hot lava hitting the glaciers, with house-sized boulders tumbling down mountains. The British naturalist Gilbert White and American Ben Franklin wrote in 1783 that “a peculiar haze” hung over Europe, the Atlantic Ocean and America for many weeks. Most of the livestock in Iceland died, along with 25% of the country’s population. The extreme weather is believed to have inspired certain political events. It is a primitive, awe-inspiring sight. It is easy to understand why early Icelanders named their volcanoes such things as “Gate to Hell” believing that souls could be pulled down into the molten, moving masses of earth. The problem is, the eruption of Eyjafjallajökulle, even if it stops fairly soon, may trigger an eruption of a nearby, and much larger, “sister” volcano called Katla. Iceland’s “Gate to Hell” is re-opening. How much of its ancient history we have to re-live is just as much a force of nature and out of man’s control as it has been for centuries.